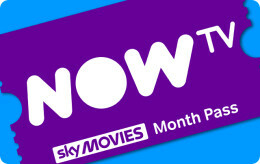 NOW TV Sports Month Pass digital gift card terms and conditions Access 7 Sky Sports channels live. After pre-paid period, Sky Sports Month Pass automatically renews at its then current price (currently £33.99pm) unless cancelled. Offer price lost if you cancel your Pass before the last month of the offer period. 18+. UK only. NOW TV account set up with debit/credit card required. 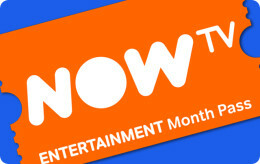 Streamed via Broadband/3G/4G/Wi-Fi (charges may apply) to compatible device – see list on nowtv.com. Content is representative only and channels are subject to change. You can only have one Sky Sports Pass in your account at any one time. Red button and interactive services aren’t available. Voucher must be redeemed within 1 year of purchase otherwise void. Terms apply. About NOW TV Sports Month Pass digital gift card This is where you can catch the games of the year, the major races and the matches that everyone will be talking about! 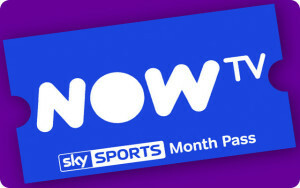 With a NOW TV Sky Sports Month Pass, you’ll receive your very own ticket to the best sporting action on TV. With access to the latest Sky Sports action for a month. What better gift to give your fellow sports fan? Choose a Sky Sports Month Pass and kick start the sporting action at home or on the go whenever you’re ready! 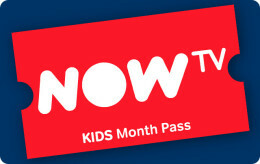 NOW TV Sports Month Pass redemption instructions To redeem your NOW TV pass you must visit http://www.nowtv.com/sports If you're new to NOW TV follow the steps below 1. Click ‘Buy Sky Sports Pass’ and select Month Pass 2. Follow the steps to create your account (will ask for card/debit details but you will NOT be charged) and enter your voucher code to start watching. If you're already with NOW TV follow the steps below 1. Sign in with your NOW TV username and password 2. Select any 'Buy a Sky Sports Month Pass' button 3. Click 'Apply a voucher' and enter your voucher code. Your pass lasts for 30 days after you start watching. Your pass must be activated within 365 days of purchase. You can only have one Sky Sports Pass in your account at a time. Red button and interactive services aren't available. Currently not available on YouView.